PBS™ Manufacturing software for small businesses is a powerful, easy to use manufacturing management system. PBS Manufacturing offers the user the technology they need to succeed without all of the overhead necessary to execute similar systems. While many systems are designed by technical people, like programmers and systems analysts, PBS Manufacturing was designed by manufacturing practitioners. Its designers based this system on the teachings of APICS. APICS was founded in 1957 as the American Production and Inventory Control Society, Inc. In the early 1990s, it adopted the name APICS (The Educational Society for Resource Management) to acknowledge its growing international presence and expanded scope. Its manufacturing principles are accepted around the world as the standard. It’s important to understand what’s driving everything in the PBS Manufacturing system when it comes to the material and capacity planning aspects. Simply stated, the system helps to make supply and demand match. This is sometimes referred to as JIT (Just In Time) manufacturing or Lean Manufacturing. No matter what you call it, the goal is the same. 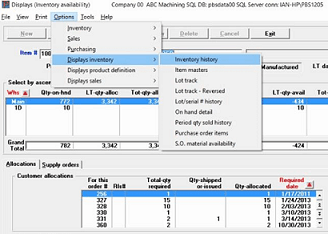 PBS Manufacturing software for small businesses allows you to have materials on hand when you need them.